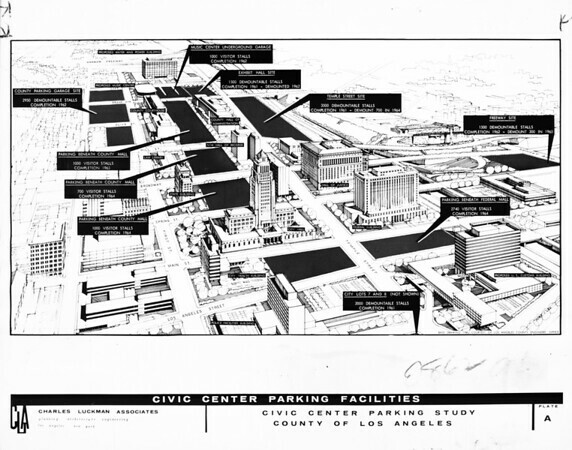 Photograph of a drawing of "Civic Center Parking Facilities" bound by Los Angeles Street, Sunset Boulevard, Harbor Freeway & First Street for "Civic Center Parking Study. County of Los Angeles". "Base drawing thru courtesy of Los Angeles County Engineers' Office" at bottom right edge of both prints. "Dark shaded areas in the drawing above show the recommended location of parking facilities within the Civic Center area an their relation to key governmental buildings. The Comprehensive Parking Master Plan by Charles Luckman Associates would place visitor parking in the center of the building complex and disperse employee parking to the periphery" -- press release attached to one verso dated 1 January 1961. Clipping dated 4 January 1961 attached to other verso. Clipping dated "April 30, 1961" attached to the third verso. The verso dated "April 30, 1961". "Los Angeles, City, Civic Center" -- on the verso.